(From Nikon lens literature) Combines four fixed focal length super-telephoto lenses into a single compact super-telephoto AF Zoom Nikkor lens. VR operation offers the equivalent of using a shutter speed 3 stops faster. Two VR Modes: Normal mode or Active Mode for when taking pictures with extreme movement . Automatically detects when photographer is panning and compensates. Exclusive Silent Wave Motor enables ultra-high-speed autofocusing with exceptional accuracy and powerful super-quiet operation. 4 Extra-Low Dispersion (ED) glass elements minimizes chromatic aberration and provides higher resolution and superior contrast. Minimum focus distance of 6.2 feet at all focal lengths. Internal Focusing (IF) design for smoother focusing and great body balance. M/A mode enables instant switching from autofocus to manual with virtually no time lag even during AF servo operation. Rounded diaphragm (9 blades) for natural blur. Detachable tripod mounting collar provided. Picked this up used - can be impossible to find new for months at a time. Have used for wildlife and shooting cliff dwellings in the Southwest. This is a great lens - meets or exceeds expectations. Have a monopod or tripod available for best results though you can handhold and get amazing results with the VR. Only possible issue is size - this is NOT an easy lens to deal with in carry-on luggage or on back-country hikes. I usually carry it in the middle of a large Tamrac backpack which is marginal as 'carry-on' for some planes. You will also find that you attract an inordinate amount of attention when using this lens. You can use a 1.4 TC and get good results. Despite Nikon's warnings you CAN get AF with a 1.7 TC in good light but don't depend on it. It will start to hunt as light falls off. You CAN use a 2.0 TC if manually focusing. Having a manual focus screen - like Katzeye - helps. This lens will be passed on as part of my estate (like my father's Contax). Build Quality: You never have to worry about having this lens stolen from you...you can use it as a formidable weapon of self defense. The metal body is nearly indestructible, well shaped and all the buttons, switches and zoom/focus rings are well placed. It is a bit heavy to handhold for more than two or three football plays, even with VR, so it is at its very best with a monopod. The hood is excellent, rarely allowing flare (but be careful with it, I sat on a bag with just the hood in it, damaging the latch irreparably, and the new hood was $280). Focus: Nothing to say, it's fast and silent. Lock is secure and definite, while tracking is smooth. Image quality: cannot be expressed in words. Stunningly sharp from f/4 to f/13--it handily out resolves my D2x. DOF control is superb, with beautiful bokeh and crisp transitions from in focus to out of focus. Colors are clean and saturated, with few to no aberrations. VR: Does its job, 3-4 stop handholding/monopod advantage over non VR lenses. Helps tracking and framing as it keeps your viewfinder steady. I really cannot say enough about how fantastic this lens is. Also, it works very well with the TC-14e and TC-17e. I've been using this lens since December 2004 for wildlife (mainly birds), on both the D70 and D2X, mostly with a shoulder stock. It' s a superb lens for this work, especially with the D2X, which balances better (and whose High-Speed crop mode is often useful for an "instant' 1.5X telextender). The only real weaknesses I've noted, aside from price and weight (it's about as big as I'd care to use with a shoulder stock) are a tendencey to ghosting and flare on backlit subjects (common to most of Nikon's newer lenses, I gather), and that is does not work well with the Nikon 2X telextender: a careful 2X uprez in Photoshop will yield a better image. (Haven't tested carefully with the 1.4X telextender yet). The various focus lock & memory buttons also aren't well positioned for a shoulder stock, tho are presumably OK for tripod use. But all said, it's a super wildlife lens, both because of the excellent VR function, and overall image quality. This may be the best lens I have ever tested, used, or owned. It's sharpness throughout almost its entire focal length is unsurpassed, even by prime lenses. The VR function is intelligent - it automatically detects if you're using a tripod and adjusts itself accordingly. Its two VR modes (normal and active) give tremendous flexibility and utility. 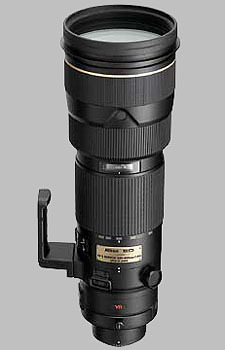 Coupled with a DX-format Nikon DSLR (and thus with an effective focal length range of 300-600mm), this may be the most useful wildlife lens ever produced (at least to this date). In a perfect world I'd like to see the lens smaller and lighter, but laws of physics do prevail. Nikon: please give us a 400 to 600 or a 300 to 600 in this same quality and with the VR function! First impressions were ... this lens seems huge, especially when the long lens hood is attached. This impression is fuelled by the very large carry case it comes in. Probably the most impressively constructed lens case I've ever seen with oodles of protective padding ... but why oh why didn't Nikon create enough room to carry the lens with a D2 body attached!? Just a few more inches of latitude and it would have been a perfect fit ... a seriously missed opportunity Nikon, shame on you. Once you get to use the lens for a while, it doesn't seem quite so huge, but it is heavy. At 56 years old, I'm not up to using this handheld for more than a few minutes, so for me a monopod is a must-have companion. When you rotate those silky smooth zoom and focus rings you begin to understand why you had to spend so much money. The build quality of this lens is in a completely different league to any other Nikon glass I've ever owned. Simply perfect. Auto-focusing is so fast, accurate and quiet it takes your breath away. I found myself deliberately swinging onto new subjects to see if I could catch it out ... not a chance, it acquired the target first time every time and before I could blink (D2X and D2H equally impressive). 1.) The lens comes complete with a 52mm slip-in NC filter. Apparently it is essential to have a "filter" of some description fitted to complete the optical path. I decided to buy an optional slip-in polarising filter, which at nearly GBP200 is not cheap. It really irks me then, that this filter comes supplied in Nikon's usual cheap and nasty over-sized two-piece plastic box with layers of foam to support it. Foam deteriorates over time, breaking down chemically, which can leave a nasty coating on your expensive filter. Filters of this price and quality should be delivered in small, neat, tailor-made holders which do not require foam. Please take note Nikon. 2.) It's early days for me with this lens, but I have already experienced a number of occasions when "orbs" of light have appeared in my shots. I assume this to be some kind of internal ghosting / flaring taking place in the lens, but surprisingly these occurrences are almost always with the sun on my back, when I would not expect such problems to arise. On every occasion I had the hood attached so I cannot see that it can be flare across the front element, but I should say that I have not yet removed the protective glass front element yet (not that I really want to), so that may be a factor. I will be interested to see whether other reviewers are experiencing this problem and can shed some light on it. Despite these little niggles, I remain delighted with this lens. I have had several insights into what it is capable of ... I just need to practice my long-lens technique with the unforgiving D2X to maximise the return on my investment. Please feel free to visit this gallery on PBase to see some of my very first efforts with the 200-400, the majority of which were taken using the D2H. Conclusion - A must-have lens if your wallet will stretch to it.